Happy Tuesday! I'm so excited to share this outfit with you guys! 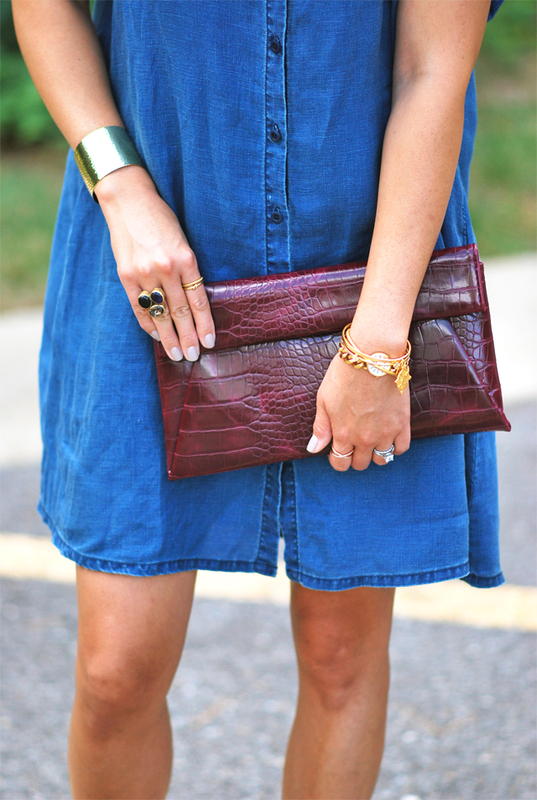 Ever since I saw this Madewell Indigo Linen Tunic Dress, I told myself that I had to have it. It's seriously the perfect dress for Fall. We don't have a Madewell in Annapolis anymore and the nearest one is about 45 minutes away, so I didn't get a chance to try it on before purchasing online, but I can tell you that it did not disappoint at all. Reading the reviews helped me decide what size I should get (I prefer it to be blouse-y and loose). 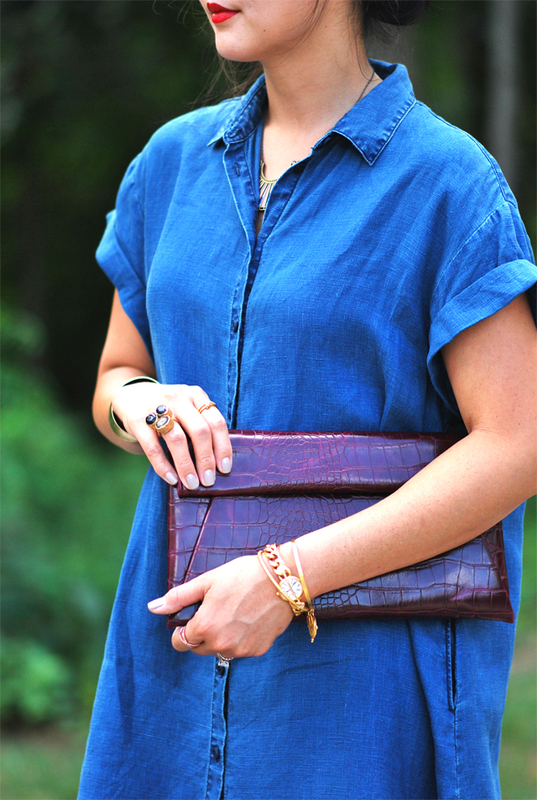 And I knew it would go perfectly with this crocodile clutch from South Moon Under. 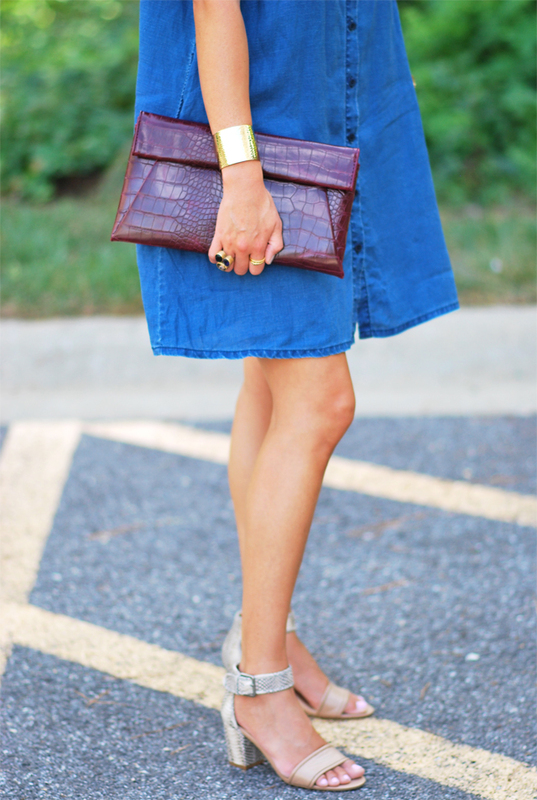 Even though it's only recently cooled down in temps for us, this dress is the perfect Summer-to-Fall transition dress. You can bet that when the weather gets too cold to wear open toe shoes, I'll be pairing this dress with booties. It's such an easy dress to wear, and can be worn in a multitude of ways, all with different accessories. I went the simple route with a few nods to Fall, but you could pair it with a tote for work (like this or this) and some chunky-heeled pumps, or go super casual with some flats (like this or this) and a cross body bag for running errands. It may seem a tad pricey, but it's such a classic fabric and shape, that I know I'll get lots of use out of it for a long time. And it's a great dress for those of you who are pregnant or are breastfeeding. Not tight around the middle and has easy access for the latter. Did you decide to size down one size or two? Thanks!